I’ve always thought there was a misconception when it came to boxwood wreaths. For some reason, they’ve become the “Christmas Wreath”. And while I completely and utterly think they are beyond fabulous at Christmas, I do think they can be used throughout the rest of the year too! 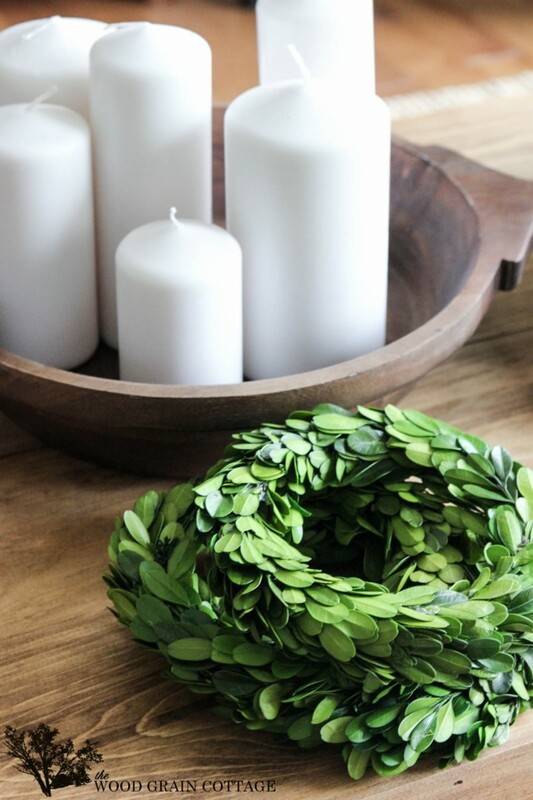 So today, I’m sharing how to decorate with boxwood wreaths… year round! One of the reasons these wreaths make such a statement, is because of their vibrant green color. It’s no wonder they are so extremely popular during Christmas, but they also work year round too. I love to use them as a statement piece, especially when the wreath is this big: 23″! And that amazing vibrancy works fabulous for spring and summer, and with lots of gorgeous neutrals! It gives such a punch of color, and provides an instant focal point. And even if you don’t have a big wreath, a smaller 16″ wreath looks fabulous too, just make sure it is proportionate to the other items hanging on your wall. So… if you’re wondering how you can use these gorgeous wreaths, fear not! They are entirely versatile… as long as you keep them in the house. Because they are actually real, they do the best in the house with a spritz of water every few months or so. online shop! They’re one of my very favorite items! Love love love boxwood wreaths! Mwondering where I could,get one of those mug holders you have? Can I ask where you found these? I hope they will be available soon, my new house is almost finished and I want one for my mantel or entry way. So glad you are moving forward on your online shop and wish you good luck. when will you shop be open? I really want to order the wreaths! I love boxwood and use it all year round too and have a couple of wreaths hanging up. It just breathes life into the house. Enjoy your weekend. Can’t wait to see your new shop. It’s so funny you posted this….yesterday I noticed that my sister’s house has beautiful boxwoods in her yard and I mentioned wanting a wreath. Looking forward to your online shop. Congratulations! Can you advise me of the best, secure way to hang a 22” preserved boxwood wreath? It will either be hung on shiplap over the fireplace, or on a drywall wall beside. Thanks.